Ready to take winter portraits in a studio environment? Wanted to capture that vicious winter blizzard but it never snows in LA? 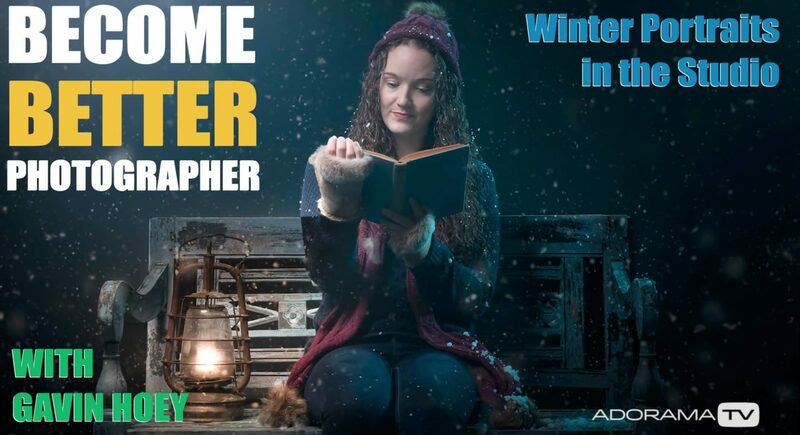 In this episode the photo guru Gavin Hoey with Adorama TV is going to share a handy trick – creating an outside winter environment inside the studio! Today we are meeting Gavin Hoey in his small home studio with amazing model Lauren who will sit on a “park bench” – as a part of the photo scene. Behind the bench we’ve got a black background. The lighting for this is going to be a multi light setup which means three lights. Let’s see what each light individually does and work them out one at a time, starting with our key light, which is an eVOLV 200. Gavin continues: “Now I’ve got it off to the side because if it was centered it would give really flat lighting which isn’t what were going for here. I’ve also got it in a 70cm soft box with a grid and its the grid that really makes a difference because that means I can get direction and control of the light, very important in a small home studio. The second light for this setup is around the back and its another eVOLV 200 and its going to act as a separation light. It would put a little bit of light on Lauren’s shoulders, on her hat and just separate her off of the pure black background. It will also put some light onto the smoke when we will use a fog machine. There is a blue gel on that light to imitate the winter’s evening, nighttime type shot – a cold blue feeling going over her shoulders and hat. Now let’s do the shoot! In some shots, as you noticed, Mr. Hoey used “fake snow” spray can – a very handy tool to spread snow flake-like dust around the subject. But to add a vast amount of snow in the picture we would require help of Adobe Photoshop. And Gavin’s special plugin! Lets have a look and see how it works. There are four types of snow with this action. We will choose ‘heavy snow’ type. Once you’re done and you’re completely happy just go up to layer and then flatten image. Now let’s add some warmth in the picture – light the lantern! To do that, lets go to filter and then Camera Raw filter and from here – get the adjustment brush now to light the lantern. Put the temperature, tint, exposure, highlights and clarity all the way to maximum. Everything else is zeroed out. Then with a nice small brush with one or two clicks, we can light the lantern! To emphasize that “street light” we mentioned earlier – the one on Lauren’s face, let’s apply a small lighting effect. Go to layer -> New and layer -> OK. Get a nice big paint brush and do a single click in the corner to add the glow from the light. With a few more tweaks and adjustments the snowy winter bench picture is completed! will take place on January 9th, 7-9pm, in one of our Los Angeles studios !! !